Throughout the day students wandered in and out of the gallery to spend some time knitting and crocheting as part of a workshop hosted by Yiara Magazine called Bundle Up: A Yarn Bombing Fiasco! The workshop is the first in a series of four organized by Yiara and held in collaboration with multiple universities and art and feminist organizations in the city. The project aims to get as many groups and individuals as possible involved in the collective creation of a wearable piece of clothing that will be installed on the statue of Louis Cyr in Saint-Henri on Nov. 22. Entertaining as it is to imagine the hyper-masculine eight-foot-tall figure of the Québécois strongman outfitted in brightly-coloured yarn, the practice of yarn-bombing functions on deeper levels as well. Typically an urban form of feminist activism, yarn-bombing aims to disrupt the everyday pedestrian’s experience of city life in ways that force him or her to question the cold, hard masculinity of the environment we live in. The materials of our outside space are largely chosen for their permanence and utility; concrete, stone and brick make up structures that serve specific purposes for commerce and industry. To install a material like yarn—which contrasts those qualities so starkly—around urban landmarks is to contest what a shared public space should look and feel like—and why. Some of the reactions from authorities and the public that yarn-bombers encounter highlight the practice’s subversive aims. Gaudet described an incident where she was questioned by a security guard while installing a piece near Place-des-Arts: the guard first asked her to take the piece down, then considered it for a moment longer and changed his mind, telling her he liked it. “Most of the reactions are overwhelmingly positive,” Gaudet said. “People love to touch the yarn, interact with it, especially children. Even if the work is taken down, yarn-bombing retains an extended life online. 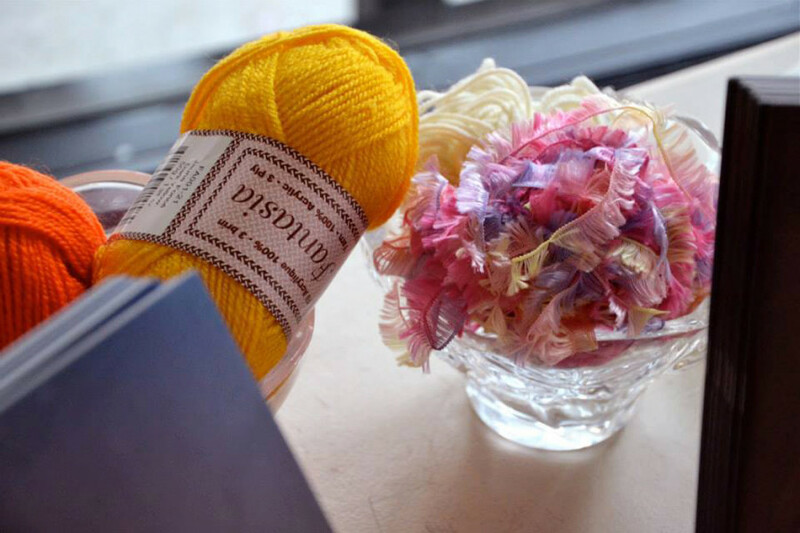 The historical connections between knitting and crocheting as typically feminine activities situated in the domestic sphere also play a subversive role in yarn-bombing. To overwrite a public space with the type of yarn work women have done for centuries is to reclaim a femininity that supposedly belonged in the home. It acts as a loud insertion of traditional womanhood into a masculine urban space that is not viewed as even safe for women, especially at night—let alone welcoming. The word yarn-bombing is itself interesting due to its unexpected violence—when asked, Gaudet and Buisson explained that it functions as a kind of joke. Using yarn to disrupt rather than console make the activity a sort of guerilla art, somewhat like graffiti in its often politicized message but more often a kind of visually disorienting jolt or shock for the general public. As students joined the Yiara Magazine masthead and Les Ville-Laines in the VAV Gallery to learn how to knit and crochet while snacking and talking about yarn-bombing, they acted in certain ways as a revolutionary installation themselves. The process of artistic creation became one everybody shared, with the pieces of knitting themselves acknowledged as ephemeral, instrumental in beginning and continuing an ever-evolving conversation. Yiara Magazine is a feminist art and art history magazine that publishes written and visual work by Montreal undergraduates. To learn more about upcoming events check them out on Facebook and Twitter.